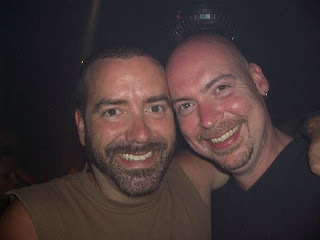 For the past few years, I've gone on vacation to Provincetown, MA with Nick and Mitch. It's always SO much fun! So many laughs! So many DRINKS! Whew! Not only do I love the afternoon tea dances at the Boat Slip and the dancing every night at the A-House, but I also love the nights when I get to cook dinner for everyone. Last year, Nick asked me if I knew how to make coconut shrimp. To be honest, I thought "Well, I've never made it before, but how hard can it be?" So, I said "SURE! No problem!" (as if I've made it a hundred times.) I looked at several recipes online and found this one from Tyler Florence. It's so simple to make and it's delicious! I included recipes for two different dipping sauces. Try them both! In a small bowl, whisk together corn starch and egg whites until foamy. Peel and devein shrimp, leaving the tail on. In a deep saute pan, add an inch or two of oil. Heat oil to medium heat, not scorching hot. Dip each shrimp into cornstarch/egg mixture, then dredge in coconut. Turn shrimp so that the coconut sticks to all sides. Saute shrimp in oil for about a minute or two, then turn and saute for another minute or two. Remove shrimp from pan and drain on a paper towel. Serve with dipping sauces (recipes below). For each recipe, simply combine all sauce ingredients and serve alongside your cooked shrimp. For the dipping sauces....You can use pineapple or apricot preserves if you're not a fan of the orange marmalade. And the cocktail sauce is just a mixture of ketchup and horseradish. You can easily make your own instead of buying it.